Note: the pictures on this post don’t do the dessert justice- at all! Please trust me on this one- this recipe is delicious, easy to make and even impressive. I’ve mentioned before that I occasionally get cooking or baking ideas into my head and can’t get them out- until I find out how good they might be. Yesterday’s Eureka moment came while I was at work. (Yes, on a Sunday. No, I am not insane, nor a workaholic. Ok…maybe a tad of both.) It wasn’t until later at night that I was able to get into the kitchen to start tinkering. That’s when the first disaster struck. Ok, it was (thankfully) the only disaster, but it was pretty bad. The lid to my food processor was missing. Yes, the very same machine that won’t turn on without a lid. Panic set in as I searched my kitchen, my pantry and my mind, trying to come up with the AWOL lid. Nada. That’s when I resorted to plan B. Yes, that is just what you think it is. A rolling pin and roughly (excuse the pun!) 2 cups of Oreo cookie crumbs. In a not-totally-unrelated note, this is an excellent recipe to try next time you are very, very angry. Try it, thank me later. Back to my cheesecakes. So the crust was prepped, and the filling had to be made. Here’s where things get interesting. I was making this non-dairy. You have to realize that I am unforgiving in the substitution department. One bad attempt and I give up on said substitution. I had been hesitant to try Toffuti cream cheese for a while, but finally decided to give it a shot. If chocolate can’t make it good, nothing can. Important note: If you want to make these dairy- awesome! Use real cream cheese, real butter…and send me a slice! Crust: Melt butter and combine with Oreo crumbs. Press into pan of your choice (see below) and place in freezer while you prepare batter. Batter: In the bowl of an electric mixer, beat the cream cheese until fluffy. Add sugar, eggs and vanilla and beat until light and fluffy. And cocoa powder, flour and coffee (dissolved in water) into mixture and stir to combine. Pour over prepared crust and prepare according to directions below, depending on the size of the pan you use. 4″ mini pie pans: Follow same instructions as below. Bake about 30 minutes or until just set. Will make approximately 4-6 mini pies. 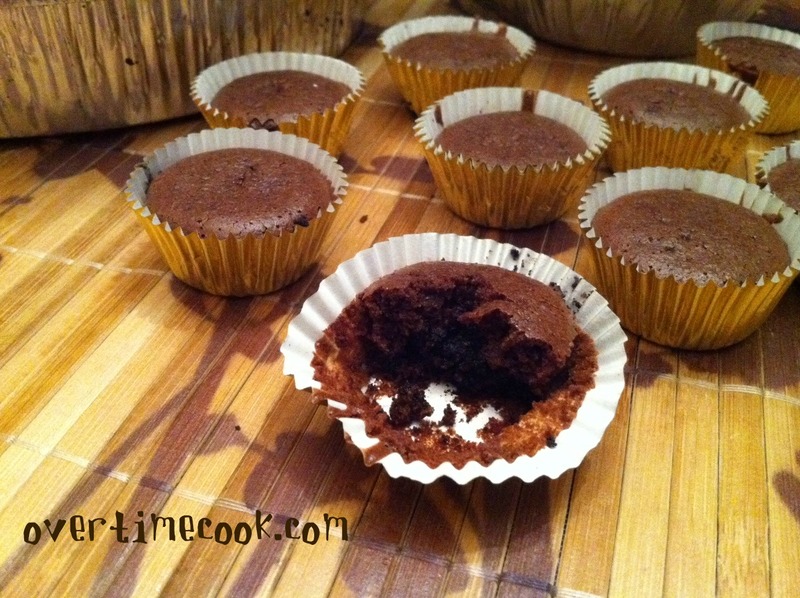 Mini muffin pans: Line a mini muffin pan with paper lines. Place a small amount (about half a tsp) of the crust mixture on bottom of liner. Press down to make sure it’s even. Pour about 1-1 1/2 tsp of batter on top of each one. Bake 14-17 minutes. Note: this will make a LOT of mini cheesecakes. While this is great for a party, it will take quite some time. I suggest halving the recipe or making a larger one and some small ones. Note: These would probably look a whole lot better with a chocolate drizzle or glaze of some sort, but I am serving these in a week and a half, and I think they will freeze better without a topping. Be imaginative! Can you see the chocolatey deliciousness of the cheesecake meld together with the decadent chocolate of the crumb crust? You want this. Told you so. Wonderful looking cheesecake! I hope you find the lid to your food processor soon. 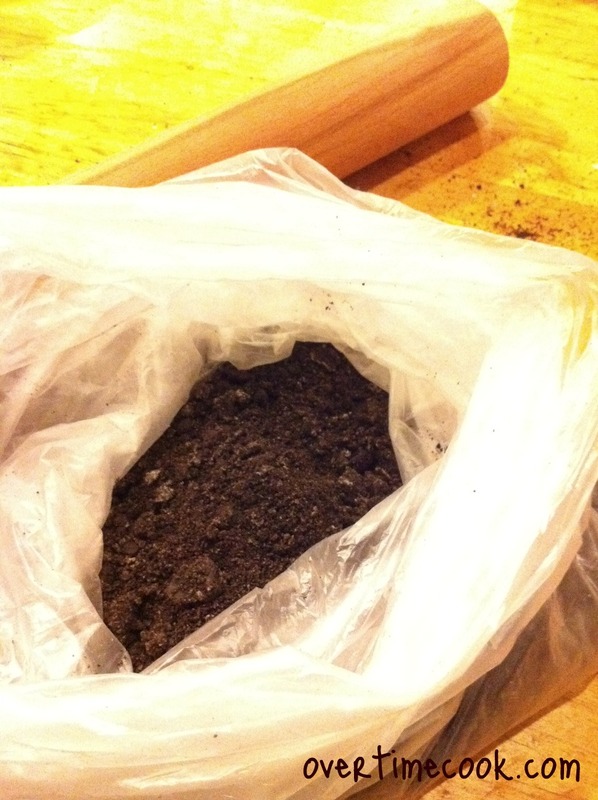 Totally get how making your own Oreo cookie *crumbs* by way of a rolling pin is a great stress reliever. Thanks Paula! 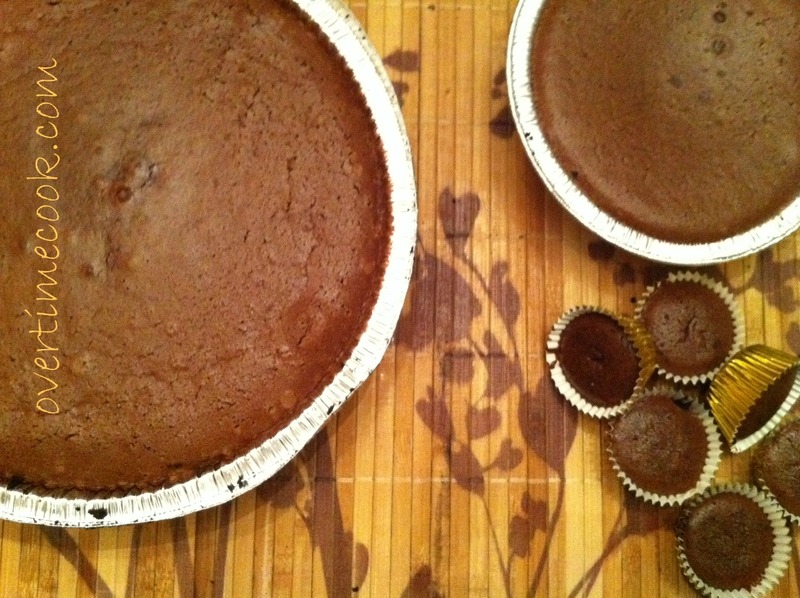 I actually found the lid just after I put these into the oven! Talk about ironic, huh? Thanks Christina! My family liked the oreos a lot better than the graham cracker crust I used last time. Coffee + chocolate is a winning combo! Thanks for stopping by! It’s probably my favorite combination! Love the idea of making them in to “cupcakes”. Yum! 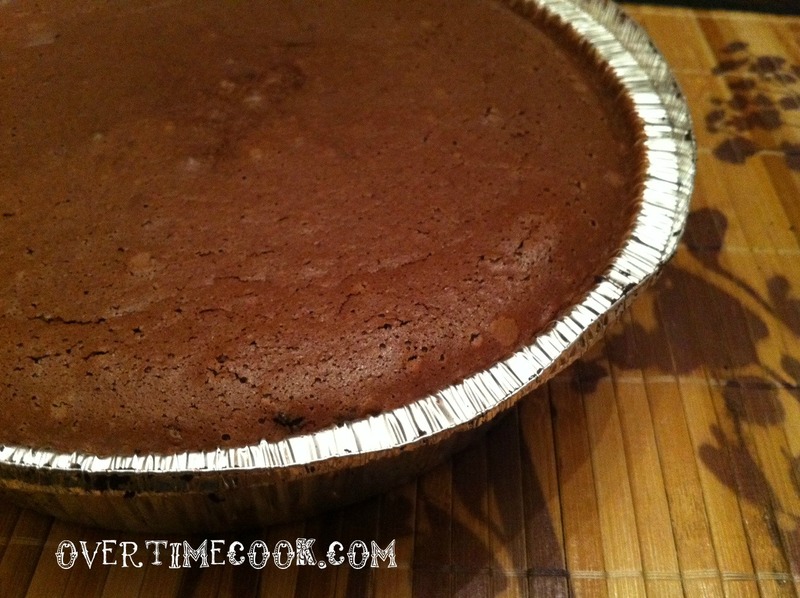 Pareve chocolate cheesecake? Yum! I love the idea of the mini cheesecakes, too. These will look gorgeous with the chocolate drizzle. These are for Sukkot? They sure are! They actually freeze nicely. I made a similar version for Shavuos (with real cream cheese). The mini cheesecakes are a bit of extra work but totally worth it! Yum! This looks so incredibly delicious. I love the combination of coffee and chocolate. Yummy favor combo. Looks great! Thanks Hallie, and thanks for stopping by! Wow, this looks amazing! I’m all for adding coffee to everything and anything. These step by step pictures are great! Thanks! I have been wanting to get into real step by step, but it’s tough because the lighting in my kitchen is horrible! Looks wonderful! How cool that you were able to make them dairy-free! Thanks Jill- honestly I am surprised at how well they turned out. Yum! I love all things cheesecake but I’ve never tried one like this. Can I use brewed coffee or do I need to use instant? I’ve never made it with brewed coffee, but I imagine the coffee taste would be even better. It has to be very strong though. Wow. This is SO my kind of dessert. Without ready access to actual Oreos, I think I’d make my own. Would it be enough to use the cookie part, or do I also need the cream? Thanks for stopping by! Firstly- I didn’t use real Oreos. I used a generic parve version- they don’t sell those in Israel? If you do make your own, I’d say you could skip the cream but increase the butter/margarine. Way to go! The coffee and chocolate can make such a difference. We love cream cheese at our house. 🙂 Thank you for sharing these individual ones at Joy of Desserts. Looking forward to more of your recipes. Chanie- I’ve never made this cheesecake in a springform pan, but as you see from the picture the 9 inch pan was pretty full so you should be ok. This is egg-ier than most cheesecakes, which is why the texture is so awesome. Is it not too sweet with 2 cups of sugar? Whenever I make a plain pareve cheesecake, it calls for 1/2 c sugar. This is one of the most popular desserts I make, and nobody has ever complained about the sweetness, even people who don’t like things very sweet. Don’t forget that those recipes probably call for one package of cream cheese, and this calls for 2. Also, the cocoa adds bitterness to it. I want to make this for our chanuka party and was wondering if you have any caramel topping recipes that I can pair this cheesecake with? Hi, should I be using whipped cream cheese or the 8 oz unwhipped blocks? When you say Oreo crumbs, do you mean the cookie together with the cream, or do you remove the cream? Thank you!